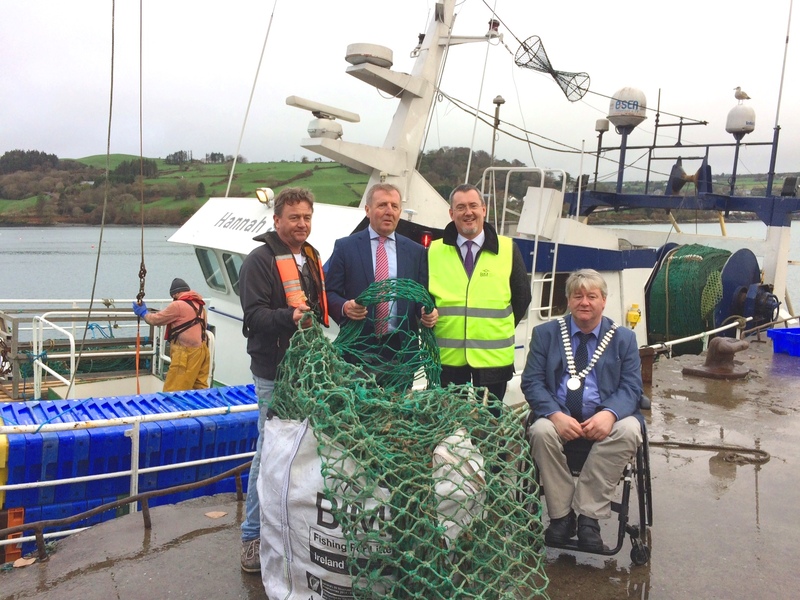 L – R Adrian Bendon, owner of MFV Hannah J, Minister for Agriculture, Food and the Marine, Michael Creed TD Jim O’Toole Chief Executive Bord Iascaigh Mhara and Mayor of the County of Cork, Cllr Patrick Gerard Murphy inspect the contents of a Fishing For Litter bag. By providing segregated waste reception facilities the Council aim to make it easier for fishermen to help turn their retired fishing equipment and other waste into a useful resource for recycling or up-cycling. This minimises both cost and any negative impact on the marine environment. Cork County Council has worked on the innovative and award winning Circular Ocean Project and is currently working in conjunction with Bord Iascaigh Mara (BIM) and the Cork Institute of Technology’s Clean Technology Centre in order to design and develop a sustainable waste reception system for fishing vessels. Through the Council’s Harbour Master in Union Hall, the very successful BIM’s ‘Fishing for Litter’ programme has been successfully revived. This programme encourages fishermen to collect marine litter and dispose of it, free of charge, in participating ports, helping to keep waste out of our oceans. With the support of local fishermen and the local community, Cork County Council has, through the Union Hall Harbour Master, facilitated the collection of scrap metal on the pier. The result of this was not only a significant clean-up of working and storage areas on the pier, but in a cheque to the value of €4,900 from the scrap metal collection company which was shared between the RNLI and the local Tidy Towns Committee. Other Council projects include the reutilisation or up cycling of wire spools, the upgrading of the waste oil collection facility and the testing of fishing nets shredding equipment.